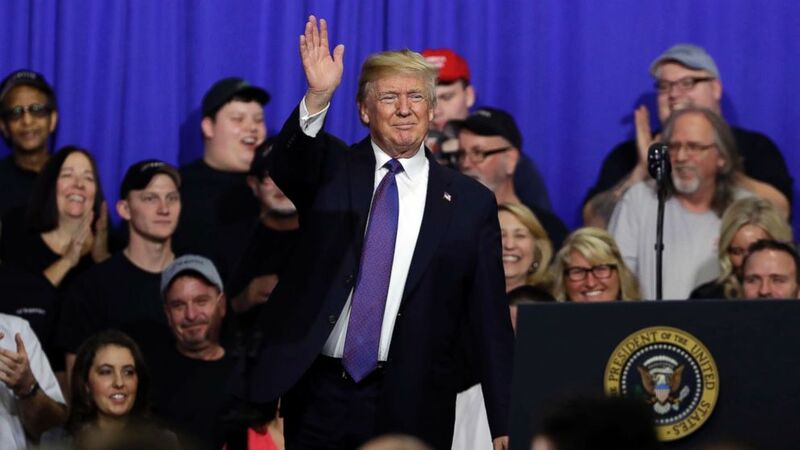 President Donald Trump traveled to Ohio Monday to tout the economy and the recently-enacted tax law – in a preview of his message against Democrats in the upcoming midterm elections. While the White House insisted the trip was not political – Trump at one point took aim at Democratic lawmakers who sat stone-faced during his State of the Union address last week – likening their response to treason. “It got to a point where I really didn’t even want to look too much during the speech over to that side because honestly it was bad energy. It was bad energy,” he said at a manufacturing plant a Cincinnati suburb. Sheffer Corporation President and CEO Jeff Norris (R) speaks on stage with US President Donald Trump following a tour of the Sheffer Corporation, Blue Ash, Ohio, Feb. 5, 2018. Speaking at Sheffer Corporation in Blue Ash, Ohio, Trump also said Democratic gains in Congress would be bad for economy. “If they ever got in and took over, your taxes would go way up. You’d see bad things happening. Wouldn’t be good. That, I can tell you. Would not be good,” he said. Trump derided a frequent target of Republicans — House Minority Leader Nancy Pelosi, saying “She’s our secret weapon” for the midterms. The president delivered his remarks as the Dow Jones Industrial Average nose-dived down more than 1,500 points before rebounding before the closing bell. The Dow closed at 24,345.75 – down 1,175 points. The president made no mention of the tumbling stock market despite taking credit for its performance in the past. Hours before the closing bell, the White House downplayed the stock market drop, attributing to the ebb and flow of the market. Ahead of his remarks, the president toured the Sheffer plant, which manufactures cylinders and gave its 126 employees $1,000 bonuses after the Republican tax law was enacted last year. ABC’s Jordyn Phelps contributed to this report.